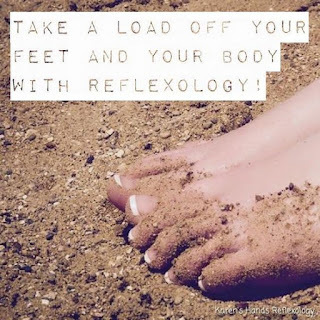 Andrea Banks Clinical Reflexology: What happens at the start of your Reflexology Treatment? What happens at the start of your Reflexology Treatment? You will be seated in an appropriately comfy chair with your feet on a footstool with a couple of hot water bottles to keep them nice and warm. I will "greet your feet" with a firm reassuring hold while I tell you what to expect during your treatment. I will apply a small amount of lotion and I will treat your feet so some "relaxers“. This is like a warm up, during this time I am looking to see if you have any areas of concern, specific points of interest, flexibility and stiffness. You should start to feel relaxed and then I will begin your treatment.